I have such an obsession with chairs. Looking on craigslist for chairs, looking on ebay for chairs and searching flea markets and antique stores for chairs. All of these efforts are so I have a new project and another chair to recover. 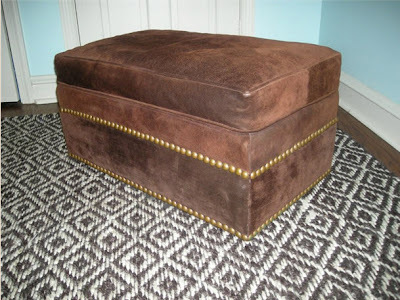 I would also love to learn how to upholster to create some of these beauties! It's certainly easy to reupholster a dining seat or a piece with just a cushion, but a bigger project is something I leave to the professionals. oh, me too. 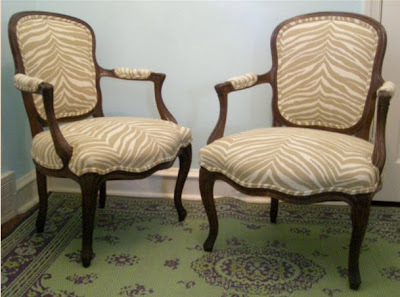 I just bought some antique balloon back chairs and need to have them all tightened and re upholstered. It would be much cheaper if I could do it myself although the man I use is on the cheap side and a sweetie. I'm with you...if I had a garage or a basement, there'd be all sorts of projects on my list. Living in a small space just doesn't allow it. However, I have to tell you that I'm pretty sure I remember there being an upholstery course offered through adult ed...maybe it was in Brookline or Boston? Granted, I haven't lived in the area since 2005, so that might be a thing of the past. That bench is so cute. I think it would also be fun to do a yard sale day. Have yet to do that since living here! 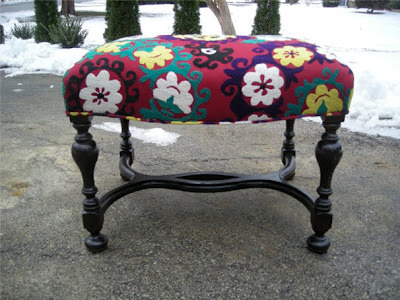 Love that settee - so pretty and petite! I have an old loveseat in my parents' basement that I'm dying to reupholster, but don't have any room for it in my house. Someday! i don't have the patience but wish i did!!!! im with you on this one. when u learn will you teach me? Oooh...! I really like the 3rd image! The fabric is so rich and saturated! 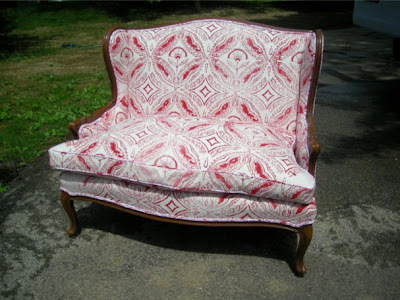 I am dying to learn how to reupholster furniture. I think you're pretty good at it based on your other posts! Have you heard of the Eliot School? It's in JP and they teach Upholstery there..check it out! I would love to learn too, someday right? That would be a great skill to learn! Again, so envious of the fabulous selection you seem to have on Boston's Craigs List! I've just found your blog...yay! I have a chair obsession too (as you can see by my blog name!). I did an upholstery course several years ago which was great for learning the basics but even after doing rather alot of projects, both for myself and others, I find that each piece I work on is different in some way than anything else I've done so it's very much learn as you go. That blue and white striped chair you did looks great, you should definitely keep it up! I bought a chair earlier this year and it's just sitting there WAITING for me to re-do it. I've been putting it off because I'm going to have to pay somebody to reupholster it since I can't do it myself, and that costs $$. I have an obsession with chairs myself! I just finished my first re-covering project and picked a cabana stripe pattern (maybe a mistake!) I'll probably be posting some pics on The Finer Things eventually. Thanks for stopping by our blog-- so glad to have found yours-- love your style!